It all started out quite calmly……..
Amy cooked Brian his favorite meal in honor of our 6 month anniversary (chicken fried steak and mashed potatoes). We had planned on eating the top of our wedding cake after dinner, but Brian ate so much steak that he didn’t have room for anything else. Brian was hard at work studying for some CLEP tests when his hard working brain decided it needed to have some sugar. So, he and Amy broke out their wedding cake top. Together they cut a piece for Amy. Then Brian proceeded to put a little icing on Amy’s nose while she wasn’t looking. 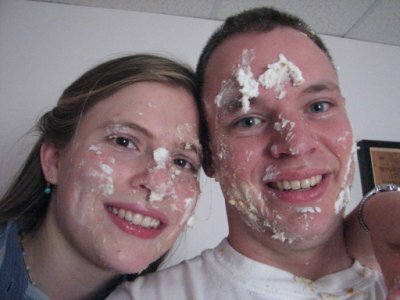 This was payback for when she put icing on him after their wedding. 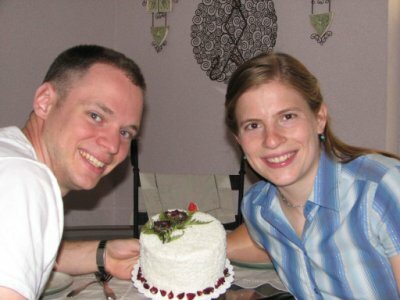 The two happily ate their cake and drank milk while remarking on the jelly filling that they hadn’t gotten to taste on the day of the wedding. Finishing off a quarter of the cake, they scratched their heads as to what to do with the rest. Brian thought of putting some back into the freezer to save for the one year anniversary (we were originally saving the whole thing for then, but it takes up a lot of room). Now half of the cake is left, so the happy couple proceeds to dig out the jelly filling and eat it. Brian then innocently takes a big chunk and smears it all over Amy’s face not expecting the quick comeback that would follow. I’ll spare you all the details, but Brian had a great time and really messed up Amy’s kitchen (and face and hair and ……). But being the gentleman that he is, he helped her clean up and they are still best friends.